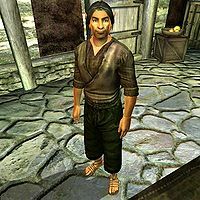 Anguilon is a Bosmer pirate who currently resides in Anvil while The Serpent's Wake, the ship on which he is employed, is being refitted. He resides at The Fo'c's'le and is one of many seamen who receives nightly visits from promiscuous innkeeper Mirabelle Monet. He spends most of his time at the popular dockside inn The Flowing Bowl, eating and drinking with the other pirates—so much, in fact, that on rainy days he will spend all day, from the time he wakes up at 10am until he goes to bed late at 4am, partying at the Flowing Bowl. When the sun is shining, he will take a few trips to other destinations: at 3pm, he will leave the dockside and spend three hours near the pond in the northeastern part of Anvil. At 6pm, he will head back to the dockside and stroll around for three hours on the top deck of The Sea Tub Clarabella. During the night, while Anguilon is fast asleep, there is a good chance that Mirabelle Monet will sneak into his room at 6am and slip into bed right next to him. He wears a set of typical lower-class attire consisting of a coarse linen shirt with green linens and a pair of braided leather sandals. He carries around the key to The Fo'c's'le and a small amount of gold. In combat, he relies on an iron dagger. He is rather unapproachable and will, in typical hostile pirate-fashion, only greet you with: "I don't know you, you don't know me, everybody's happy." When asked about the city of Anvil, he will once again reject you with the words: "It's a big town. Hell, it's a big county. You stick to your part, I stick to mine, all right?"